Summary: This collection of blogs, podcasts, articles, videos, and other media provides a variety of textual experiences you could use to give students a layered reading and writing experience related to Ferguson and Black Lives Matter. The collection creator, Paul Allison, poses two qustions: “How can we help students to connect around important issues of race and justice in our time?” and “How do we build curriculum, rituals, tools, and skills in modular, open, inspiring ways that will give students the permission to follow their passions, yet also invite them to go deep into important issues as committed and informed citizens?” While the collection focuses specifically on the death of Michael Brown in Ferguson, Missouri and its aftermath, it underscores the value of creating multimodal resource collections to encourage teachers and students to explore issues of social justice locally and more broadly. This collection asks: What’s the pilot light in our curriculum that helps students to connect around important issues of race and justice in our time? Another way to ask this question: How do we build curriculum, rituals, tools, and skills in modular, open, inspiring ways that will give students the permission to follow their passions, yet also invites them to go deep into important issues as committed and informed citizens? How can we use social reading tools like http://genius.com and http://nowcomment.com to engage students in critical, close reading and collaborative inquiry? How can we use resources such as those in this collection to see if we can move our conversations and our curriculum about race into the kinds of institutional and structural work that is suggested by the researchers at Race Forward? We have been studying their report Moving the Race Conversation Forward and creating learning experiences for our students in which they can do similar kinds of research and perspective-taking. This institute’s work around Preventing Racial Inequity in Schools and Beyond has become an important area of inquiry for the Youth Voices/Teachers Teaching Teachers network of educators. This is what we have been talking about on Teachers Teaching Teachers and building into our missions on Youth Voices: how to introduce Race Forward stances, protocols, and practices into our classrooms. And further, we are asking how we can use Youth Voices, Hangouts On Air, and other tools such as NowComment and Genius to have conversations across schools. Our segregated school systems too often lead to students having these conversations mainly with peers who are a lot like each other. We seek–mainly through Youth Voices–to break down some of these walls. I’ve also been working on a Gooru collection of resources around Selma. And the exciting bevy of resources out there attached to the #fergusonsyllabus is an ongoing inspiration. And please remember to join our little corner of the movement on Teachers Teaching Teachers every Wednesday at 9pm Eastern/6pm Pacific at http://edtechtalk.com/ttt. Yesterday was cold in Denver…really cold. My husband decided this would be a good time to go houseplanting shopping. He watched a TedTalk about how houseplants increase the amount of oxygen in buildings in Delhi. Since I wanted to spend time with my husband, I decided to simply go along for the ride. We got to the greenhouse and were a bit dumbfounded. We have grown houseplants, but we really don’t put much thought into what we buy, mostly because most of our plants have been gifts. So we decided to ask for help. After all, the staff wasn’t busy because, remember, it was cold outside. …the problem is that she did not listen when we told her we live in a high rise condo. She did not hear us tell her that we don’t have a garage, or that we don’t have access to a hose. And using a bucket the size she proposed was definitely out of the question. It was not that this woman was malicious or purposefully didn’t listen to us. I don’t believe this at all. No-I believe our experience is so different from hers, she simply did not register what we told her. When we have experiences that are so far off the path others have, it is difficult for others to understand. Our living arrangement is foreign for her, so she made the assumption that all families live in houses with yards and garages. This made me think about all the chatter on Twitter and Facebook about the #Ferguson verdict. I have to say that I feel really badly that my friends of color feel hurt and angry about the white reaction to this verdict. I wish I could do more. But in reading their Twtter feeds and Facebook posts, it has helped me glimpse into their experience in a way I never could before social media. It has given me a perspective different than the one shared in purely public spaces; it has breathed new life into my own perspective to help me understand where my friends are coming from. With social media at the forefront it seems like maybe, just maybe, if we (white people) listen to what is being said, we might come to understand the perspectives and experiences shared with us. My hope is that this will help all of us understand one another in a deeper way. Social media offers a chance to deepen conversations about race. I hope that we actually listen to one another. Even though we come from different experiences depending on our race, if we listen to what one another has to say, maybe we can heal together. On Teachers Teaching Teachers (TTT) we have been thinking about how Ferguson and the movements around Black Lives Matter impact on our classrooms and our interactions with students. Source Photos: “Making model airplanes for U.S. Navy at the Armstrong Technical High School. Washington, DC.” Office for Emergency Management. Office of War Information. Domestic Operations Branch. News Bureau. (06/13/1942 – 09/15/1945) Taken March 1942. 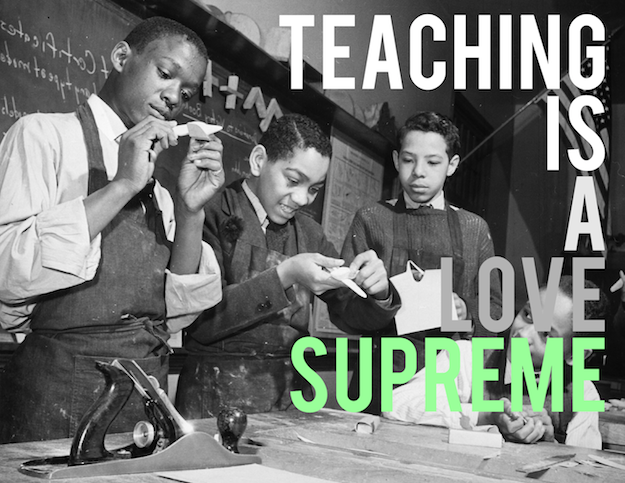 A Love Supreme: Reflections on Why We Continue to Teach | contains a sample of “Acknowledgement” from John Coltrane’s A Love Supreme. Originally recorded December 9th, 1964. © 1964 MCA Records, Inc. The son of Trinidadian immigrants, Brendon currently teaches kids World History, African American History and Sociology at the Girard Academic Music Program in Philadelphia. He earned a bachelor’s degree in Political Science from Columbia University and a master’s certificate in Secondary Education from the Penn GSE as a Philadelphia Teaching Fellow. He returned to Penn, as a James Madison Fellow to earn a M.S.Ed in Teaching, Learning and Curriculum with a focus on Gender and Education. Last year he completed the National Board Teaching Certification process. Beyond the classroom, he affiliates with Teacher Action Group (TAG), a group of like minded teachers working to organize, innovate and empower other educators throughout Philly in the midst of this a politically orchestrated school funding crisis. His experience includes work as a Lehrman Fellow, National Constitution Center Annenberg Fellow, and an Education Pioneer Fellow with the SEED Foundation in Washington DC. He is an advocate for public education interested in developing structures that support diversity and student voice in school communities. Shamir Reese, a special education teacher, mentor, and youth advocate, is currently a special education co-teaching 7th and 8th grade literacy. He has been the only African-American male SPED teacher in his school for two different schools within a 3 year period. Shamir has been a youth advocate for going on 10 years advocating for youth ranging from Philadelphia, to San Francisco, to Nigeria. Currently, Shamir is volunteering for several mentoring groups, one of which is at his school, Cleveland Elementary, called Men of Mastery. Kenloy Henry, A Penn Alumni and Bill Gates Millennium Scholar, recently worked in the KIPP Philadelphia Schools system as a High School history teacher. Recently he moved to New York where he has been serving as an advisor and mentor to inner city youth preparing for the college application process. Kenloy is also participates in the Urban Community Teachers Project and the Black and Latino Male Initiative at Brooklyn College. He is passionate about improving the lived experience of inner city youth. He can be reached at khenry03@gmail.com. Philadelphia Writing Project, is an active member of the Teacher Action Group (TAG Philly) and has been teaching secondary students to read, write, and make sense of thew world for more than 17 years. He blogs for the Philadelphia Public School Notebook and has previously contributed to the University of Pennsylvania GSE Perspective of Urban Education. Reed recently won the prestigious 2014 Black Male Leader Award (BMe). He can be reached at sriii2000@gmail.com. Raymond Roy-Pace is a classroom teacher, mentor, and servant leader. He began what he describes as a calling into education over five years ago serving communities as an administrator and classroom teacher. His greatest joys are working with youth in and out of the classroom. So much so, that in 2011 he began his own non-profit, BeU365. The mission of BeU365 is to inspire youth through creative education, mentorship and real world experiences. His passion for youth has led him to develop curriculums for mentorship programs, conduct youth engagement workshops and develop teacher trainings. In addition, Ray has served on various panels to discuss prominent issues in education and has also provided commentary, both written and orally, on youth engagement. Actions, someone said, speak louder than words. So it is perfectly logical that the Black student should say “Well, if you can’t deal with ______, what in hell can I learn from you?” His charge is that the people who would teach him the word cannot deal with life, and he has every reason to view such a people as a collective danger, surely more dangerous than bank robbers, and other assorted so-called criminals! —Llorens, D. (1971). What Good the Word without the Wisdom? Or” English Ain’t Relevant”. College Composition and Communication, 209-214. This can’t be life. Does this speak for the family of Michael Brown? Or the countless number of youth and other community members that stood [still stand] in the Ferguson streets waiting [still waiting] for a true word to be released from the police headquarters? Has Jay Nixon contemplated the violence and damages that he has led upon them? How will their welfare and safety be ensured? What would I feel if that was my unarmed child, left for dead, and they are telling me my only recourse is within the thoughts of 12 jurors who never met him? Even more home-hitting than understanding the savagery that the police harbored about the South Central families was my realization that I harbored the same NHI rhetoric for many in my own life. As a Black male growing up in Chester, PA, NHI MEANT THE COPS! NHI meant city politicians (because the city was all I knew, I read about governors and presidents in textbooks, never saw them). NHI was found throughout many private and public based accountability systems. NHI looked at your every movement through mirrors in the corner store you go to every Thursday and denied your aunt much-needed food stamps because she finally found what she thought to be her blessing of a non-living-wage job. And most unfortunately, NHI could be found all throughout our education. In our inequitable school funding. In our authoritative classroom management. In our punitive disciplinary process. In our one-way teacher-student relationships. In our prescribed irrelevant curriculum. While in each one of these facets I can represent ephemeral glimmers of hope, it doesn’t disrupt the overall arc of the environment through which we were expected to succeed. The modus operandi was [and continues to be, Philadelphia included] No. Humans. Involved. If it wasn’t, then how come we had to buy our own paper to copy pages out of textbooks we couldn’t afford because we know we are poor or they say our tax base is too small or they blame our mismanagement of funds and how this was the burdens on the shoulders of sixth graders aka 11 year olds who only wanted to have access to the math homework? If it wasn’t, then how come they would suspend you every time you missed the late bell on your way to your next class because you stopped to talk to a family member, while administrators and security guards and school based police officers quoted “rules are rules” as if we were Pavlov’s dogs needing to be conditioned to the sound of bells or beeps or whistles or megaphones? If it wasn’t, then how come suspensions could pile up on you like the promises of politicians for simply “being disruptive” in Ms. So and So’s class who only gave out worksheets and never taught because y’all kids never listened, and before you knew it, you missed all of the time to turn in your rote worksheets and summer school was $250 a credit out of your poor mother’s pocket? And I still see no changes. As an educator, these experiences inform my practice. My biggest fear is not failing to meet student learning objectives [all based on someone’s semblance of what it takes to succeed in the 21st century workplace as if they told the whole truth about how they got there], but failing to recognize, honor, and utilize the personal life objectives that we all know to gain hope, faith, and love to strive in a world where it is truly hard to find. Learning is way deeper than seeing young people celebrate knowing how to write a five paragraph essay, but found in the struggle to act upon the tangible skills, effective strategies, and interdisciplinary knowledge honed throughout human experience that it takes to meet someone’s critical needs with long-term, sustainable solutions. Because that someone could have been you. In my practice, I am trying to unlearn all the lies that we are taught through schooling and once again through teacher education. Lies such as these standardized tests matter. These grades are indicative of anything but my judgment. That sending you home or otherwise excluding you gets across a disciplinary lesson. That you need to know this insignificant google-able stuff. That this simplistic task I am asking you to do is of mass importance to me and you. These are just a sampling of the lies that we learn to spew that keep us from reveling in our humanity in solidarity with our students in the classroom. When will we stop manufacturing meaning in the classroom and start sharing in the full authenticity of life? 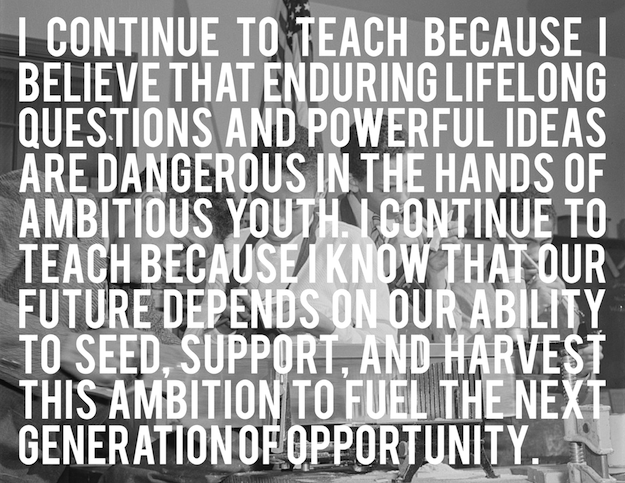 In my State of Immediate Urgency, I hope that we, in order to establish a more perfect union, drop our collective NHI policies in words and in action remembering that Freire showed us that true words are praxis. There is no speaking without acting. Only then, can we truly say justice has been established. This State of Emergency shall expire in thirty days. From henceforth, let the State of Immediate Urgency be the law of the land. In this mission on Youth Voices students are invited to choose a name from our list of 25 Stories on Wikipedia (Step 2), then read and annotate the story and do further research. Next, write a poem to remember that person, using both your imagination and the facts. Use “Night, for Henry Dumas” and “41 Bullets Off-Broadway” as model texts. Post your poem as a discussion on Youth Voices, and comment on other students’ “Black Lives Matter” poems. This mission is based on Renée Watson’s Happening Yesterday, Happened Tomorrow: teaching the ongoing murders of black men, Rethinking Schools, 2015. First of all, I’ll reframe the question: how have I been and how will I address the issues around Ferguson in my own media studies classroom? It really began on the first day of school this year when a student asked me if I’d been keeping up on “what was going on in Missouri.” That student’s question and a Teachers Teaching Teachers show with Dr. Marcia Chatelain prompted a piece that I wrote for the Guardian. PBS NewsHour also published How to talk to students about Ferguson, written by Dr. Chatelain that’s a great resource for educators. Speaking of NewsHour, since we’re a Student Reporting Lab my students’ work was also featured on the NewsHour segment Teens reflect on impact of Ferguson unrest. Their work and that of the other schools in this segment shows thoughtful, student-produced commentary. So, in addition to addressing the opening question, I think it’s important that educators not only discuss these kinds of issues in schools, but also share the wisdom that’s generated by our youth with a larger audience. Our students have perspectives that need to be included in our civic dialogue. An amazing resource for educators to bring timely civics issues like Ferguson into the classroom is KQED Do Now (if you’re a science or arts teacher, there are also relevant activities for your students too). The weekly Do Now discussion for September 26, Should the members of a police force reflect the larger population? had approximately 600 comments from students from around the country. My students summarized that discussion for a Do Now Round Up in October, Diversity and police departments. For many years I’ve collaborated with Paul Allison on youthvoices.net, which hosts the discussions of students in the classes of teachers mostly associated with the National Writing Project, but open to all educators. If you want to get a look at what teens are thinking, here’s a sampling of the Youth Voices discussions about Ferguson and related issues. One of the things I try to stress in all my teaching is the idea of perspective taking, where students consider complex issues from multiple angles. Harvard’s Visible Thinking protocol, Circle of Viewpoints, is one way to foster productive discussion around sensitive issues like Ferguson by considering the perspectives of many different stakeholders. For example, a student of mine has interviewed members of our local police department to find out how they are responding to incidents like the Mike Brown shooting in our own community (e.g. Dillon Taylor, Darrien Hunt). By the way, this student journalist I’m talking about is the one I mentioned in the third paragraph, the one who asked about the events of Ferguson on the first day of school this year. While his classmates race out the door at the end of the day today for Thanksgiving holiday, he’ll stay after school to finish his video. These curricular conversations have been happening over the Ferguson issue and other important ones throughout the year and will go on long after the media storm passes. To me what’s important is the role that media creation and productive online discussion has in the lives of our students, our future leaders. Earlier this month, Penn held its annual lecture named after Constance Clayton, Philadelphia’s first Black superintendent. The title of the lecture was “Do Black and Brown Lives Matter? Reframing Public Media Racial Narratives for Urban Schooling.” Addressing that issue was Dr. James Peterson, director of Africana studies and an associate professor of English at Lehigh University. Peterson, a leading hip-hop scholar who regularly appears as a media contributor on MSNBC and other media networks, spoke about why the Black Lives Matter movement means so much for organizing and transforming classrooms and communities. Educational institutions, he said, should be at the forefront of unpacking the issues of systemic inequities found in schools, police departments, and other areas of civic life. To reframe the often unbalanced and negative portrayal of Black and brown people, he strongly endorsed making the critical study of media essential in schools. The 24-hour screen generation needs tools for understanding and telling their own stories, he said. Instead of telling young people to stop wasting time playing video games and using social media, educators and parents need to help young people make responsible choices, reflect on the media they consume and create their own social action projects. A couple of statistics he cited jumped out at me: Every 28 hours, an unarmed Black person is killed by law enforcement, vigilantes, or security forces, and 25 percent of Black women live in poverty. These numbers alone do not fully tell the story of what it’s like to live in under-resourced communities, but they do provide some context for understanding the tense relationship between law enforcement and the Black community. Though students in many neighborhood schools may or may not know these statistics, they internalize them and develop a distrust of the very institutions that are supposed to protect and serve them. Peterson pushed back against “respectability politics,” which seems more concerned with telling young men to pull up their pants than with deconstructing the implications of poverty and structural racism and violence in our schools and communities. Mayor Nutter has been known on occasion to chastise young men to wear belts and pull up their sagging pants (disclosure: I have had the same talks with my students and sons). But the question we might want to ask is: What do saggy pants have to do with the disproportionate school closures in Black and low-income communities or the higher rates of Black and Latino males in emotional support classes? Peterson also discussed rapper Kendrick Lamar’s lyrics from his recent album To Pimp a Butterfly. On the track “The Blacker the Berry,” Lamar seems to reflect on the hypocrisy of Black men who lament the killings of those like Trayvon Martin and Michael Brown, but still commit violent acts against other Black people. During the question-and-answer portion, a young lady asserted that many of her peers disrespect themselves by listening to music that debases Black women. He appealed to the young lady and the audience, noting that hip-hop should serve as a pedagogical lens to explore the positive and negative aspects of the youth culture. When Peterson asked the young lady whether she would consider being a teacher, she dismissively said, “No way.” He used her response to highlight a point from his lecture, that there needs to be an effective teacher pipeline to get more teachers of color in public schools. In talking about schools, he noted that many are de facto segregated and lacking a diverse teaching staff. They could be seen as “mini-Fergusons,” he said. At Philadelphia’s Bartram High School, for instance, the student population is predominantly Black, but the teaching staff is mostly White. But more important than their race or ethnic backgrounds, he noted, teachers should be culturally competent to teach and serve in challenging school environments. At the end of the evening, a young male student attending the Jubilee School, a nearby private school, asked Peterson why the Philadelphia Museum of Art’s recent exhibit on 200 years of African American art was limited to just three small rooms. Praising the young man for actively listening and staying engaged throughout the lecture, Peterson shrugged, lacking an adequate response to this astute question. Then, time was up. The issue of race in museum politics would have to be a topic for another Constance E. Clayton lecture.